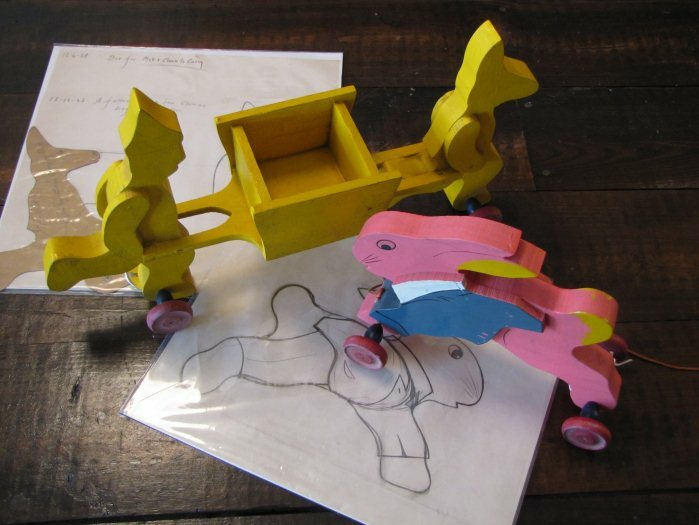 These wooden toys, sketches and stencils from the Wooster-based Toy-Kraft Company were recently acquired by the Wayne County Historical Society. The company manufactured a line of fanciful wooden children’s toys from 1916 until 1950. The toys were produced at a plant at 655 Cushman Street (current site of Friendly Wholesale) and were nationally marketed through distributors in Chicago and New York City and were lauded in one 1920s advertisement as “The most charming toys for children we have ever handled”. Positions at the factory were highly sought after as workers could earn 25 cents an hour, double the going rate at the time, with a 60 hour work week. The brains behind the company were George and Anna Hisler, originally from East Liverpool, who resided at the home they built on College and Pine Streets. They were the company’s only salespersons for Toy-Kraft, and the couple would travel to larger cities several times a year to meet with big toy brokers who would help rocket their toys to national fame. During the Great Depression of the 1930s and 1940s when many businesses struggled to survive, the Toy-Kraft Company continued to flourish as children’s toys were deemed an indispensable industry. The company made “action toys, made up in beautiful and lasting enameled colors – embracing the two great principals of child fascination” including everything from animals to transportation to Disney characters. Toy-Kraft was sold to Bauer Manufacturing Company of Wooster in the 1940s where their products were carried on in a more modern manufacturing process until 1950.